Despite its location, Kansas provided a surprising number artillerists to the Federal Army – three “formal” batteries, plus sections within infantry (to include USCT) and cavalry formations. As a whole, the Kansas artillerists have not received much attention from historians. And that is our loss, as each has an interesting service history along with a cast of characters worthy of attention. When I started out to transcribe the summaries, one caution imposed was to limit discussion of each battery to a paragraph. Basically, just indicating the battery commander, parent formation, any notable engagement during the quarter, and clarification to the information provided in the summary. But often I find the need to refine and expand upon the basic information, if for nothing else to correct ambiguities… quite often enough from my own notes! Such is the case here with the Kansas summaries for the third quarter of 1863. 1st Battery: Reporting at St. Louis with four 10-pdr Parrott rifles. Captain Norman Allen died in St. Louis on July 9, 1863. Lieutenant Marcus D. Tenney (who had for most of the year led the battery in the field) succeeded Allen, and was promoted to captain on July 20. Around this same time of the early summer the battery transferred from Missouri to the District of Columbus, Kentucky, and was part of the Sixteenth Corps. They took on duties guarding the railroad lines between that point and Nashville. So by September their mail was going to a Kentucky address. 2nd Battery: At Fort Smith, Arkansas, with with four 6-pdr field guns, two 12-pdr Napoleons and two 10-pdr Parrotts. Recall we had some questions about this battery’s reported cannon in the previous quarter. I think the line for the third quarter is more accurate, but still has question marks. The bronze 6-pdrs may have been iron. And we have to wonder were those Parrotts came from. Captain Edward A. Smith remained in command, with the battery part of the District of the Frontier. However, the battery was split into sections in the field. Lieutenant Aristarchus Wilson led two sections at Fort Blunt, Cherokee Nation (where Smith was also on duty). Lieutenant Daniel C. Knowles led the right section at Fort Scott, Kansas. Smith reported taking two sections into action in the battle of Honey Springs, along Elk Creek, Cherokee Nation, on July 17, with Wilson in command of a section of “two 6-pounder iron guns.” The other section possessed two 12-pdr Napoleons. In the action, Smith moved his Napoleons through the 2nd Colorado Infantry to a position 100 yards in front, where he directed canister fire on Confederates at 300 yards, to good effect. 3rd Battery: Also reporting at Fort Smith, Arkansas, with three 6-pdr field guns and one 12-pdr field howitzer. Let me circle back and properly discuss the origin of this battery. Henry Hopkins and John F. Aduddell recruited this battery in 1861. But, as Kansas needed cavalry more than artillery at that time, the unit became Company B, 2nd Kansas Cavalry (However, see NOTE at bottom). In the battle of Maysville (or Old Fort Wayne, if you prefer), on October 22, 1862, the 2nd Kansas captured three 6-pdrs and one 12-pdr howitzer – the cannon we see on the summary. Captain Henry Hopkins organized some of his original recruits to man this “Trophy Battery.” Hopkins remained in command of this battery through September 1863, leading it in action at Cane Hill, Prairie Grove, and Honey Springs. The battery was often listed as “Hopkins’ Kansas battery” on returns, though occasionally, starting in February 1863, as the “3rd Kansas Battery.” However, not until October 1863 was the designation made official. Hopkins was not always in direct command of the battery on the field, and signed his reports as part of the 2nd Kansas Cavalry, giving some measure of the “ad-hoc” status of the unit. The battery remained in the District of the Frontier, in Colonel William Philipps’ Brigade (also including the Indian Home Guards and the 6th Kansas Cavalry). In late September, Hopkins accepted promotion to Major, in the 2nd Kansas Cavalry and took on other duties (he was shortly after defeated in the Second Battle of Cabin Creek, which falls outside the scope of our discussions). Lieutenant Bradford S. Bassett held temporary command until Lieutenant Aduddell returned. 6th Kansas Cavalry: Stationed at North Fork (Town), Creek Nation (? ), with a lieutenant in charge of “art. stores.” Those stores included two 12-pdr mountain howitzers. Companies of the regiment operated in the Indian Territories throughout the summer and fall. But I do not know any specifics about the section of mountain howitzers or the officer in charge. 2nd Kansas Cavalry: At Fort Smith, Arkansas, with the quartermaster reporting artillery stores. But no cannon reported. Major Julius O. Fisk commanded the detachment of the 2nd Kansas at Fort Smith. The Regimental Quartermaster was Lieutenant Cyrus Gorton. Stores reported included a traveling forge and a fair quantity of tools. Furthermore, there were several militia batteries reported by the state’s adjutant. And as Kansas was a place where militia units would often see action, despite not being mustered into Federal service, we might mention them here (just because). Captain A.L. 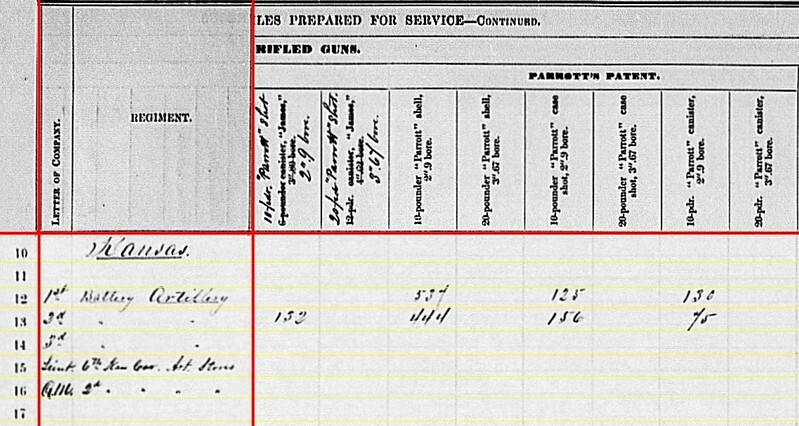 Dornbergh’s Artillery was “Company D” from Allen County. Dornbergh was a probate judge in the county and his command was called up for state service during the fall. There were probably others, but I don’t have specific details. But we know there were several Kansas militia batteries, as a year later, during Price’s Raid, at least four batteries were called up. And batteries just don’t form out of thin air… someone has to have a cannon or two! 2nd Battery: 178 shot, 229 case, and 170 canister for 6-pdr field guns; 100 shell, 36 case, and 82 canister for 12-pdr field howitzers. 3rd Battery: 100 shot, 300 case, and 100 canister for 6-pdr field guns; 100 canister for 12-pdr Napoleons; 150 case for 12-pdr field howitzers. 6th Kansas Cavalry: 140 case and 32 canister for 12-pdr Napoleons. In my opinion, we have several transcription errors here. The 2nd Battery should have 12-pdr Napoleon ammunition. 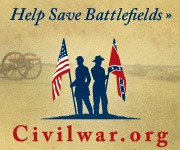 The 3rd Battery and the 6th Cavalry should not. Just where the numbers should lay is not easy to determine. The data does not track well against the previous quarter’s quantities, which did seem to be in order. 1st Battery: 537 shell, 125 case, and 130 canister for 10-pdr Parrott. 2nd Battery: 132 shot, 444 shell, 156 case, and 75 canister for 10-pdr Parrott. 1st Battery: Forty-seven Navy revolvers and twelve horse artillery sabers. 2nd Battery: Thirty Army revolvers, 128 Navy revolvers, and twenty-three cavalry sabers. 3rd Battery: Eighty-nine Army revolvers and one Navy revolver. The Kansas artillerymen would present, I think, a good topic for a graduate student looking to plow a fresh field of research. 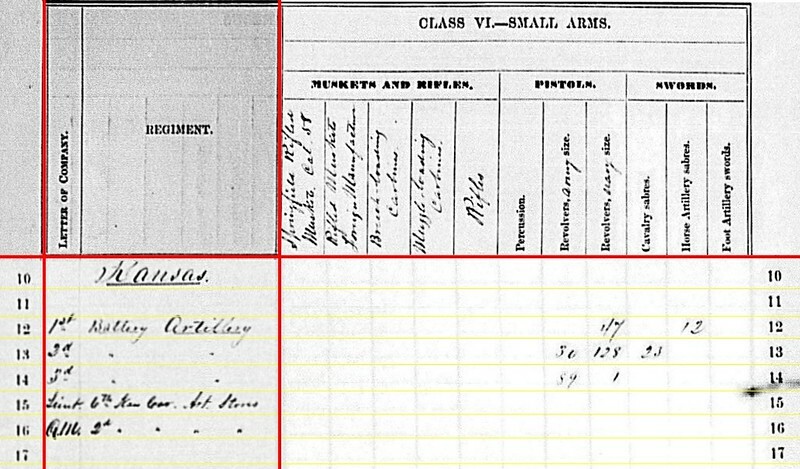 NOTE: On May 22, 1862, the 2nd Kansas was ordered to provide a detail to man six 10-pdr Parrott rifles at Fort Leavenworth. As Hopkins was in charge of the detail (if not at the start, at least later), the unit appeared on returns as “Hopkins’ Battery.” From there, the battery proceeded east to Columbus, Kentucky and eventually joined the Army of the Mississippi at Corinth, Mississippi. In September, the detachment was released from this duty and returned to Kansas. As these men had experience with artillery, they were, of course, selected to man the new “Trophy Battery” a month later. Some have interpreted this as a single battery lineage, as the commander and many of the men were the same. However, the muster rolls don’t bear that out, meaning at the time, at least administratively, the two were separate units. I won’t argue against it! Nor will I make the statement for it!